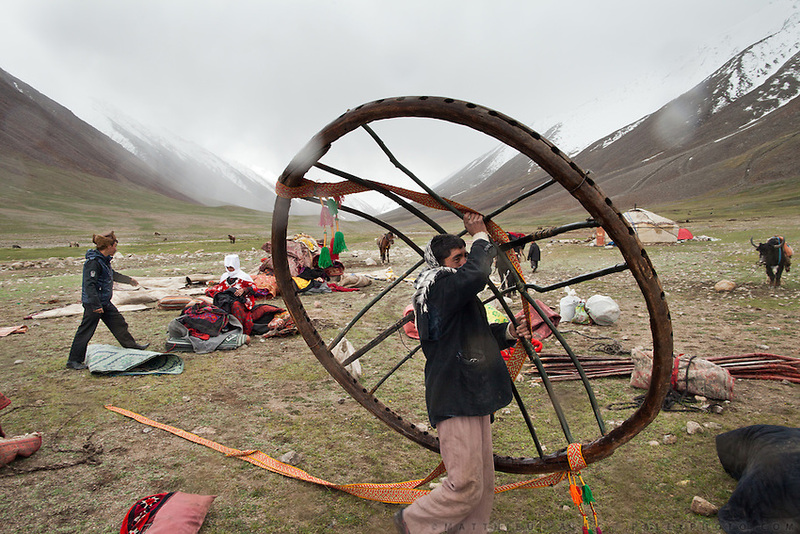 The Khan's family is setting up the yurt's centerpiece. Each Kyrgyz settlement migrates between two and four times a year, depending on the weather and the availability of grass for the animals. The grass at winter camp requires every day of the brief growing season to renew...Moving with the Khan (chief) family from the Qyzyl Qorum camp to the summer camp of Kara Jylga, on the south side of the wide Little Pamir plateau...Trekking through the high altitude plateau of the Little Pamir mountains (average 4200 meters) , where the Afghan Kyrgyz community live all year, on the borders of China, Tajikistan and Pakistan.